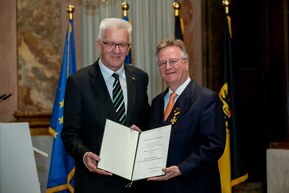 A great honor for Andreas Lapp – the LAPP Chairman of the Board was awarded the Order of Merit of the state of Baden-Württemberg by Winfried Kretschmann, Minister President of the state of Baden-Württemberg, in late April. The Minister President explained the decision to honor Andreas Lapp – "Andreas Lapp has long been setting international industry standards with his company and is a pioneer of cable technology. The increasing level of digitalization certainly challenges us to look more to the future and recognize and meet new needs. Mr Lapp and his company are very innovative in the way they do this. LAPP products do not just connect the world; they connect people." The Minister President also highlighted the fact that Andreas Lapp has been building bridges towards active intercultural understanding for many years. As honorary consul of the Republic of India for Baden-Württemberg and Rheinland-Pfalz, he has managed to get countless cultural and commercial projects off the ground and has therefore created numerous links between the countries and cultures. It was down to him that Baden-Württemberg entered into a partnership with the Indian state of Maharashtra in 2015. Mr Kretschmann continued: "It is so good to learn, time and time again, that global economic successes can go hand in hand with absolute commitment to your employees. Only when these two components are in harmony can companies and their employees increase the relevance of their business location." Andreas Lapp said – "The Order of Merit is a huge honor – not just for me, but for all LAPP colleagues. It shows the trust that our customers place in us. After all, without the trust of our customers and our employees’ commitment we could not be so successful." The Order of Merit is the highest honor of the state of Baden-Württemberg. It is presented by the Minister President for outstanding services to the state of Baden-Württemberg, particularly in the political, social, cultural and economic realms. The Order of Merit is usually presented during an annual ceremony.